Japan is the only civilization to reject a weapon because it did not fit with the philosophical/cultural norms/values that the warrior class lived by (Bushidō). now here is an idea "at a no growth economy perfectly compatible with prosperous and civilised life." Such an interesting perspective a society that chose to move "backwards" in terms of warfare; from the gun to the sword. Fascinating. I thought the book was really interesting because it contained many woodblock prints of the "gun-jutsu" before the samurai officially gave up the gun. I can't really remember any real parts from the book beside the fact that I read the entire thing in one sitting after work at B&N. "Japan's Reversion to the Sword, 1543-1879." Pretty cool history of "Japan's Reversion to the Sword, 1543-1879". I read this more for study purposes rather than for enjoyment, but it was a really nice introduction. Perrin manages to write concisely as to not bore the reader and makes interesting comparisons West vs. East. He illustrates things wonderfully with his, at times quite humorous, anecdotes and makes it less heavy to read. While upon further research not all his statements in the book might be true, it is still a wonderful introduction to the topic. Ehe answer to why the Japanese gave up the gun and reverted to the sword was because they preferred swords, and because they were isolated so they never fought in wars. We didn't need a whole book about that. This book was not as fascinating or revelatory as I had hoped it would be. The author had a bone to pick about dialing back the clock on I think nuclear proliferation that he quietly wove throughout the book. It would have worked better as an article. The Japanese have an incredible culture and history. The fact that an entire County was able to turn it's back on a technology for the sake of culture and tradition is remarkable. After reading this one I felt like there are probably a few technological conveniences that we could probably do without and it would even do us some good. An admirable attempt to use the example of Edo Japan's strict control and eventual rejection of the superior military technology of firearms to implicitly think through the feasability of nuclear non-proliferation. 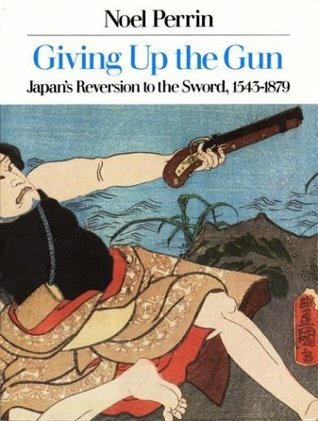 Only problem is, according to more recent social historians, guns were everywhere in the Japanese countryside: they were never "given up." This was an interesting look at how Japan gave up an entire form of technology in the 17th century. While Perrin is no expert on Japan, and his overall observations about technology are a little dated, he is a superb writer who makes his arguments effectively and with passion. I good, brief introduction to the prominence of the sword and its victory over the gun for so long. Makes me want to read an entire history of the country. But that will have to wait.